This edition covers all aspects of the subject needed by medical students. It is a volume in the Illustrated Colour Text series, with the subject matter divided into double-page spreads; this makes the information very accessible to the reader. Full use is made of flow charts and other graphics; clinical "boxes;" summary points; case histories; and clinical photographs. 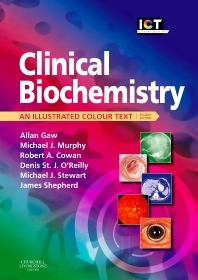 The whole orientation of the book is to concentrate on how clinical biochemistry relates to the care of the patient and to ensure that the medical student understands how to interpret laboratory.